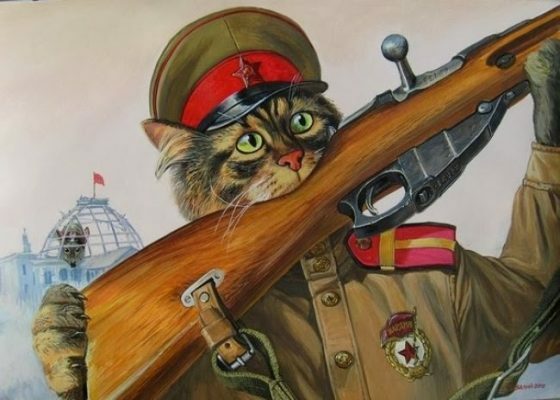 I was doing some research for a story, and accidentally found this series of soviet cats illustrations. I didn’t find the author or the idea behind them – if anyone know who he or she is, please get in touch – but the kitsch of it is captivating, so take a look. It’s official: all the good kitsch comes from Russia. Or at least a good part of it. I hope you’ve seen Svetlana Petrova’s cat, Zarathustra, making classical paintings ‘better’. 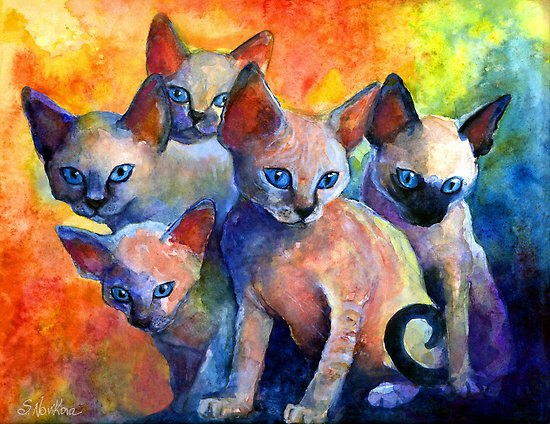 Or Svetlana Novikova’s crazy coloured animal paintings. 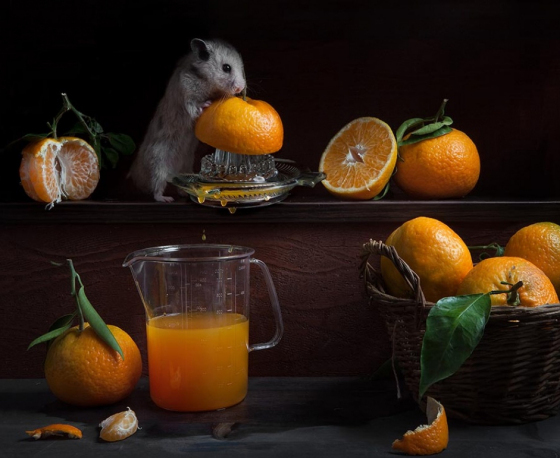 Well, Elena Eremina photographs her hamsters, in the kitchen, after her husband and child go to sleep. The result is this photo series with a Flemish still life painting air in contrast with these too-cute-to-sweet sentimental scenes. I find this contrast surprising, terrible and lovely at the same time. Andrea Mastrovito makes a lot of stuff, and most of it is worth seeing so check her website and look carefully. What caught my eye is – predictable, right? 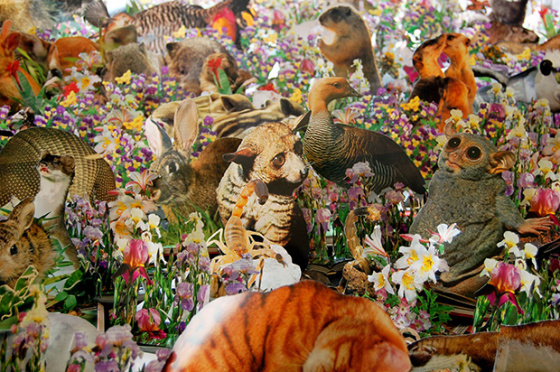 – this amazing-kitschy-surprising-collage, a recreation of the animal kingdom, her own version of Wells’ The Island of Doctor Moreau, now called The Island of Dr Mastrovito with version I and II. Well. Truth is her version is much more gentle than the original story, in which a mad doctor does all sorts of experiments hoping to transform animals into people. Mastrovito only cuts all these animals from nature books and puts them all together in this arresting installation. This is not the kind of stuff you normally see on Passepartout, but I simply cannot help myself! I find it important for you to know that orthodox priests are in the habit of blessing everything, and once they start, they never stop. 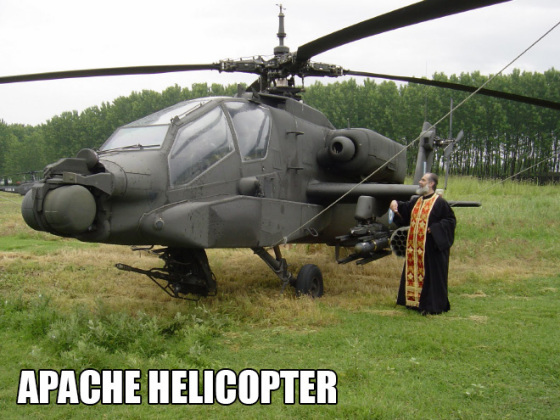 In the Orthodox tradition – in which I was born – people ask priests to bless, for example, a new house. But we don’t need to limit ourselves to that, obviously. Everything is ‘blessable‘. A tank, a horse, a spacecraft – all splashed with the holy water – in exchange for a more or less symbolic financial compensation. How much is this related to faith…I don’t know. But it also doesn’t matter. What matters is that you can just think and make a top 3 things you need to be blessed. Things will be arranged. What? You don’t like this? No, no, this cannot be. It’s 7 in the morning, autumn is coming, days are shorter… Can you tell me without blinking that you can take a look at this tomcat below and not get a warm and fuzzy feeling? I certainly do get that feeling and with this discovery, my love for kitsch art got an upgrade. These remarkable paintings are made by Russian painter Svetlana Novikova, and on her website she says her goal is to create one of a kind, exclusive original pieces of art that have a personal emotional impact. It seems to me she succeeds pretty well in doing that. It seems to me that Photoshop can create the most surprising and disturbing kitsch images. 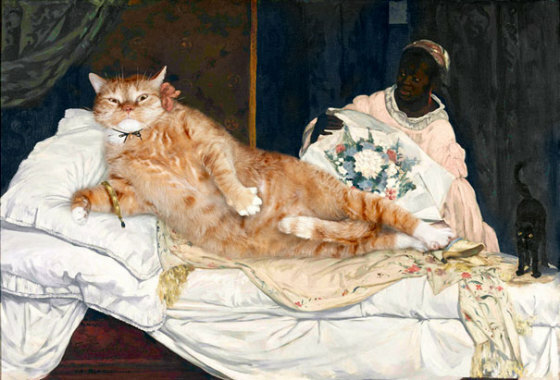 And I have already confessed my love for kitsch in this post about Zarathustra the obese cat, appearing in some very famous paintings. 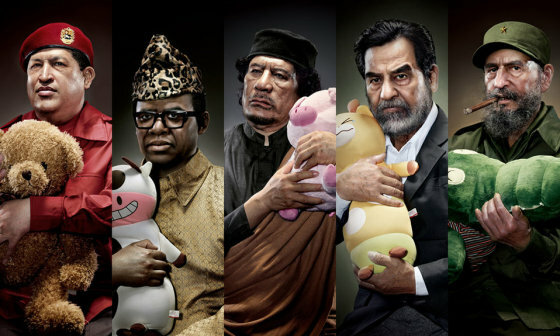 Now Chinese artist Chunlong Sun blew my mind this morning with this very convincing images of dictators and their toys. They’re terrible and at the same time I simply can’t take my eyes off them. How does someone come up with this? I really really think kitsch is underestimated. And Svetlana Petrova’s huge red cat stays proof of that! There’s something so hilariously-disturbing in seeing these collages, that they really blow my mind. And someone who comes up with the idea of adding an obese cat called Zarathustra to Botticelli’s Birth of Venus, well, that’s someone I’d like to meet. Sean Avery is an artist and an illustrator for children’s books. 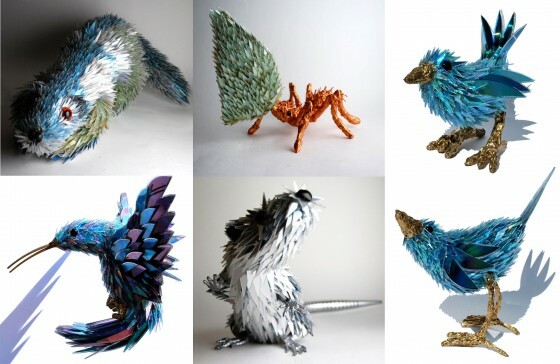 And he’s the one turning old CDs into these animals. They look a bit kitsch and don’t invite touching. 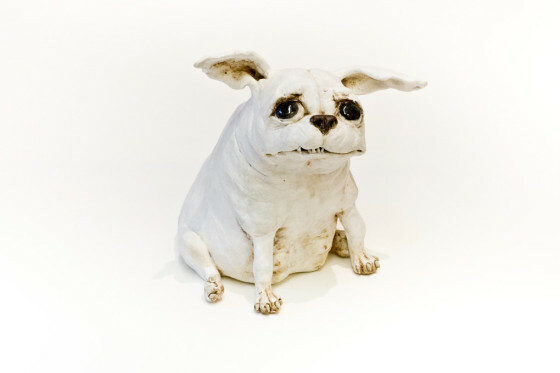 And since I find kitsch unfairly unappreciated and I have a geeky interest in things made of non-conventional stuff, I found these animals worth looking at.